"Sprouts? Sprouts?!! What can we do with sprouts?!" Of course, what I pictured in my mind was those sprouts usually put into vegetarian sandwiches (alfalfa and whatnot). We were drawing a blank with those. Then, we considered pea shoots. But, are they still considered sprouts? I mean, they seem to have gone beyond sprouts, being shoots. It's been a crazy, tiring, weird week and I don't think JS and I could have mustered enough energy to think of and make a sprouty dish. But, fortunately, not too long ago, we had soybean sprouts. We've been more or less having them as Korean-style kongnamul, or variations thereof. That time, we wanted to make something else, something we've never made before, something "fancier." 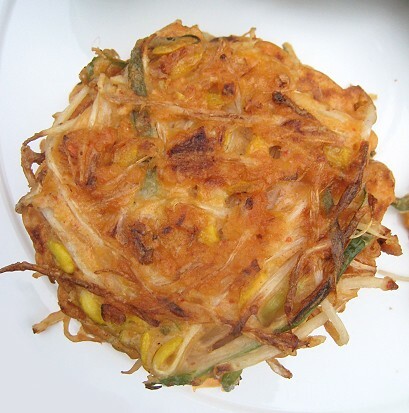 I was thumbing through The Best Recipes in the World and came across the recipe for "pajon" (Korean crispy vegetable pancake). I decided to make a soybean sprouts version. 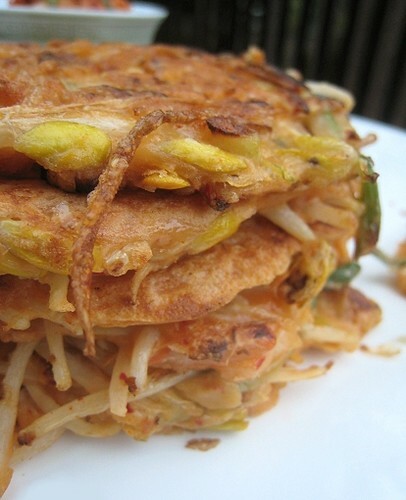 I'm calling them Kongnamul Jeon, but if I am inadvertantly butchering the Korean language, please let me know! The base of the batter was the mixture of flour, glutinous rice flour, eggs and water. 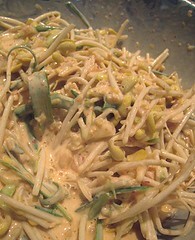 I then added green onions, soybean sprouts and kimchi. 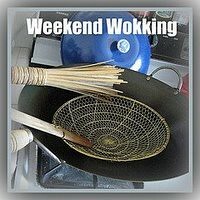 I seasoned with salt and sesame oil. I cooked them like regular pancakes: pouring the batter onto the pan, then waiting until the bottom is golden brown and the pancake cooked halfway up the bottom before flipping. Mine were small palm-sized pancakes. It was simple and easy! 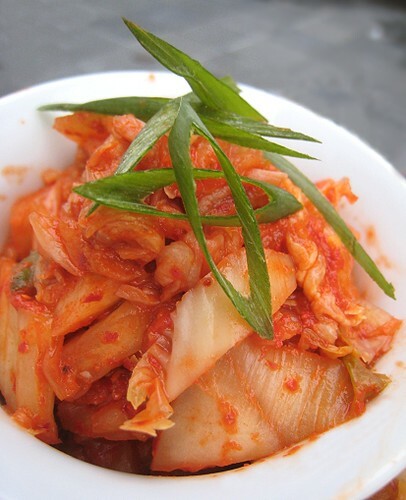 Of course, we had additional kimchi. 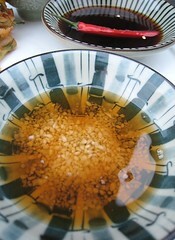 On the left is some sesame oil with coarse salt, and on the right is a soy sauce-based dipping sauce. That has soy sauce, a touch of rice wine vinegar, a little water and a pinch of sugar. I could have used more kimchi in the pancake itself for a punchier finish, but overall, this was something that was very nice indeed. The glutinous rice flour added nice "spring" and gumminess, which was a nice texture contrast with the crunchy soybean sprouts. We erred on the side of caution with the seasonings, because we did not want it to be too spicy or salty. I figure each could make each pancake to his or her specifications, with the condiments available. This is definitely another way to enjoy soybean sprouts (or any other vegetable, for that matter) for those times when we don't feel too lazy for batch-cookery. Mix the flours, eggs and oil with the water to form a smooth batter. Set aside while prepping the green onions, sprouts and kimchi. Combine the batter with the vegetables, kimchi, sesame oil and salt. The mixture will look chockful of sprouts, and that is all right. Heat a large skillet over medium heat. Add oil to coat the pan and heat until hot. Ladle batter into the pan, spreading each pancake flat. Make the pancakes any size you wish. Let the pancakes cook until the bottom is golden brown and each pancake is cooked halfway up from the bottom. Flip each pancake and finish cooking on the second side. Repeat as necessary until you've used up all the batter. 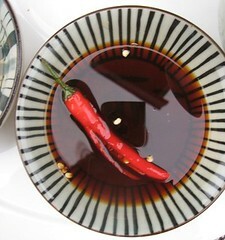 Serve with various condiments, such as Sesame Oil with Coarse Salt, Dipping Soy Sauce, or kimchi. In your condiment dish, add a generous amount of coarse salt and pour sesame oil to cover. In your condiment dish, add soy sauce, a splash of rice wine vinegar, a little water, and a pinch of sugar (not to make it sweet, but to balance the salt and acid). Adjust according to taste. Add chopped chile peppers or chile flakes, if desired. I made pajon a few weeks ago and was really disappointed in my batter. These look great! I'm going to have to give this another whirl! 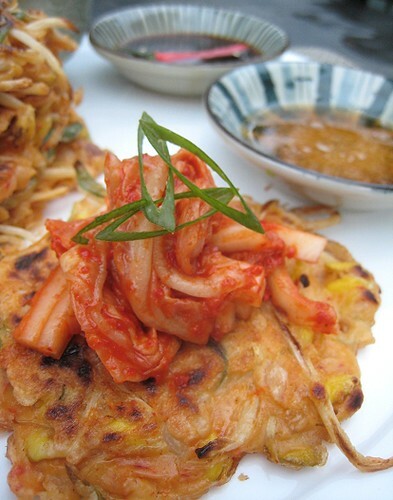 Looks great and kimchi is nice condiment for it. I've been sprouting some type of sprout every week. So, this is perfect timing for me. Thanks for reminding me to check the Bittman book! I could totally eat two or three of these right now. Hungry! 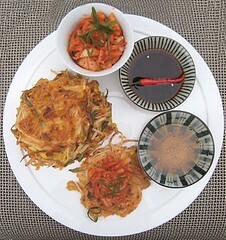 I usually use regular flour for my pajeon, but I'll have to try rice flour next time. Great idea. Don't know why I haven't tried using it before. I've gotta say - this looks like some FANTASTIC eating. Namul + Jeon make a great new combo! Looks fabulous. Thanks for joining WW. Well, it's a little different, being a little "chewy"/"rubbery" from the glutinous rice flour. Let us know how it goes! We could've added more kimchi to the batter... but having more on the side is a good way to compensate. OK, we have to see what you do with the various sprouts, because we really are at a loss with them! Thanks! 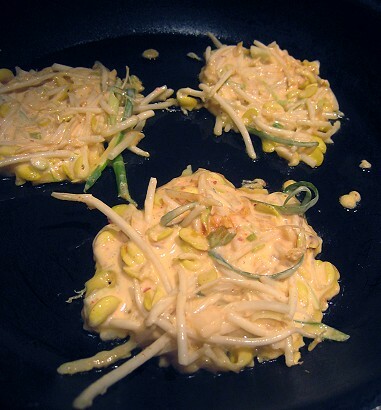 For some reason I can't get out of associating soybean sprouts with Korean food now! Hehe... telling us it made you hungry is the ultimate compliment. Hmm, we'll try using all regular flour and see what happens. I guess the "chewy" texture will be gone? It's been a while, Darius! Am going to go check out the round-up now. Thanks for hosting! This is a really creative and exciting recipe. It's not something I would have thought of! Way to go! OK, thanks! I was afraid I was just making up my own Korean terms, hehe. =) "Sproutage": teehee.